Smooth butterfly opening; Closed length: 4"
As its name suggests, the Bushmaster Omnivore Multi-Tool thrives on a varied "diet" of tasks. Cutting, sawing, filing, prying and so much more - there's practically no job the multi-talented Omnivore can't sink its teeth into. Best of all, it's lightweight, compact and tough-as-nails - perfect for demanding back country chores, simple repairs around the home and everything in between. Each tool in the Omnivore's versatile array is forged from resilient stainless steel and easily accessible via the convenient butterfly design. Built for real-world use, the Omnivore's folding implements are every bit as user-friendly as the tools in your garage toolbox. The durable polymer handle scales include grooved insets for a comfortable no-slip grip, and transport is a breeze, thanks to the included heavy duty nylon snap pouch. Never leave home without an ample, varied assortment of tools, but don't let cumbersome toolboxes slow you down.Thankfully, the Bushmaster Omnivore Multi-tool has you covered on both fronts. INCLUDED TOOLS: spring-loaded pliers, wire cutters, file, 2 1/4" knife blade, 1" knife blade, Phillips head screwdriver, flat head screwdriver, wood saw, bottle opener, can opener, multipurpose awl/detangling tool, and ruler. 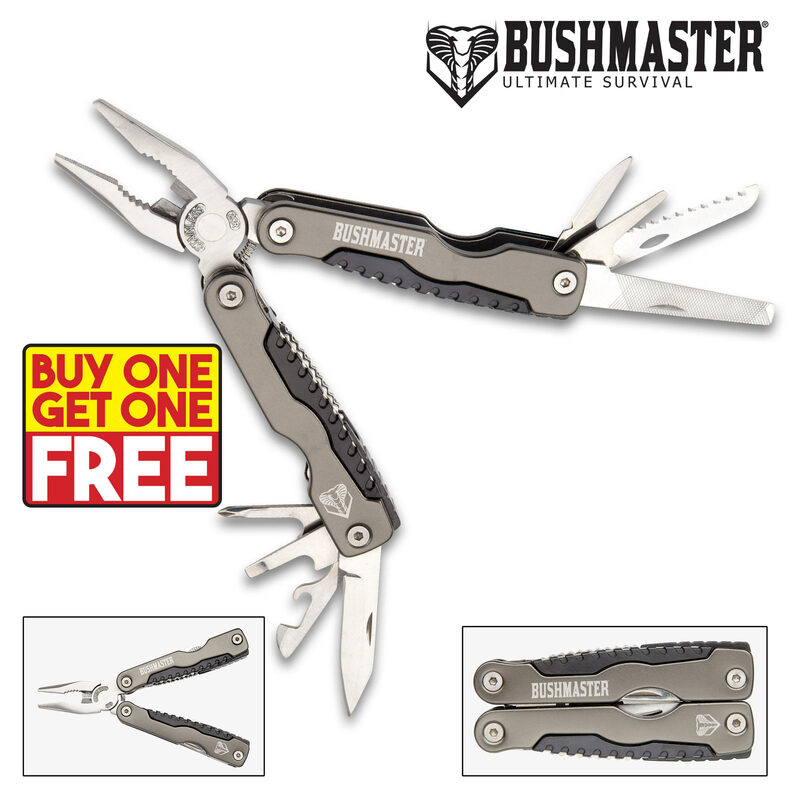 Get two of these Bushmaster Multi-Tools for the price of one, today!